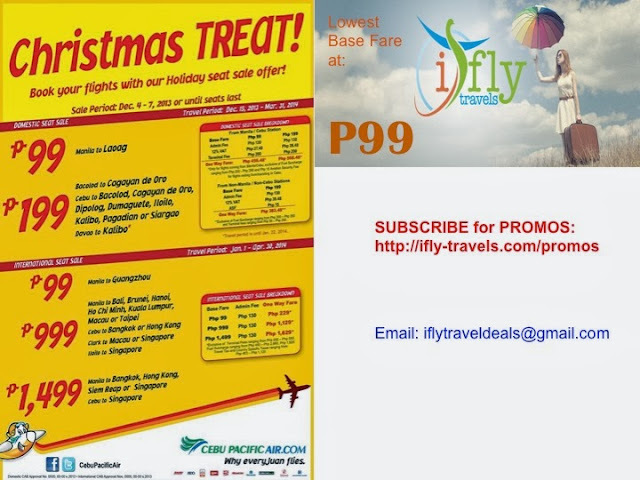 Cebu Pacific Promo Fares: Oh, Christmas TREAT! Book your next flight now with our latest #CEBseatsale! Selling Period: Up to December 7, 2013 or until seats last. International Destinations : Travel Period: January 1 to April 30, 2014. I tried to book here http://www.ifly-travels.com/book-flight/ but no response so that i can pay via cebuana. Any help? Round trip ba to ang bcd cdo? Davao Flights Seal Sale at P399!